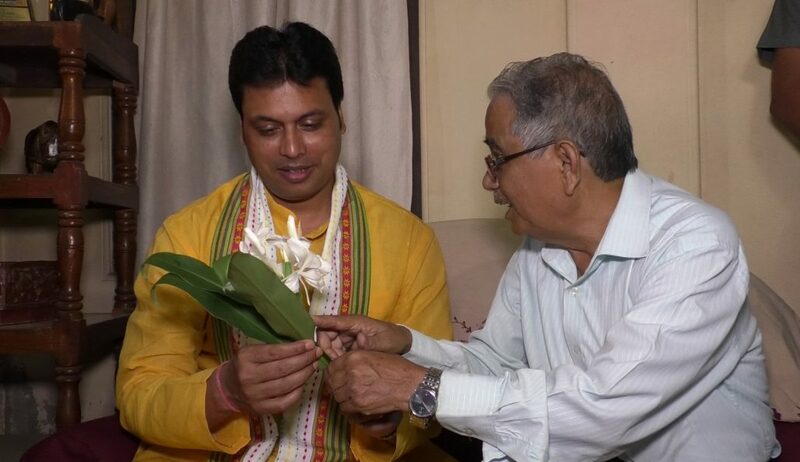 Tripura Chief Minister Biplab Kumar Deb as part of the BJP’s nationwide ‘Sampark For Samarthan’, met Dr Prafullajit Sinha, Mayor of Agartala Municipal Corporation and renowned kick-boxer Nistha Chakrabory, who recently bagged a Gold medal in WAKO Diamond World Cup 2018 in Russia. ‘Sampark For Samarthan’ is a campaign launched by BJP to exchange thought with eminent citizens and seeking their feedback on various initiatives taken by NDA Government under the leadership of Prime Minister Narendra Modi’. The Chief Minister first went to the house of the Mayor, who had won poll on a CPI-M ticket in Municipal election, and shared with him information regarding the achievements of the BJP government at the center. He also gave away booklets listing out the achievements. Then he went to the house of Nistha Chakrabory and had interaction with her and her family members on the same. BJP president Amit Shah described the “Sampark for Samarthan” initiative as something that is aimed at contacting people to seek their support to apprise them of the achievements and path-breaking initiatives taken by the Modi government. During the day the Tripura CM also had an open interaction with several other eminent people of the state.